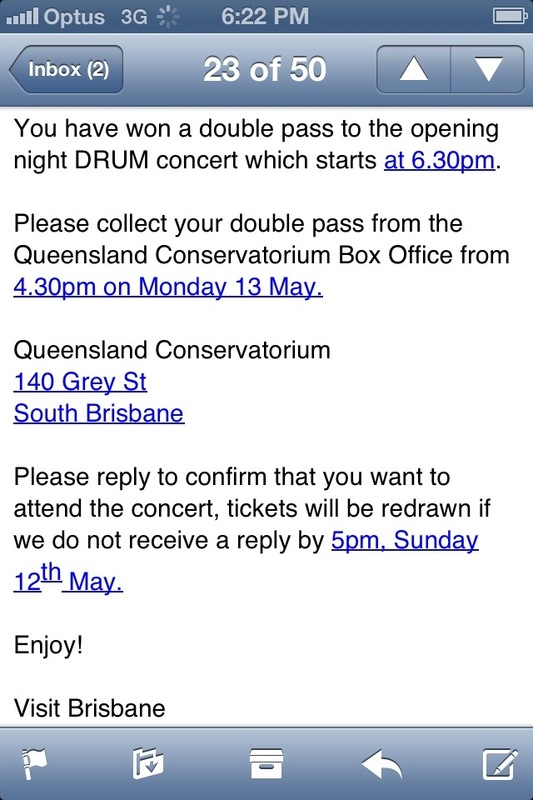 Tonight was super exciting because I won two tickets (thanks to Visit Brisbane) to the opening night performance, THE DRUM that kicked off the weeklong ENCOUNTERS: INDIA festival! I have been swamped with essays so I awarded myself with a night off! What’s so amazing about this is that there will be 70 events over 7 days at 7 different venues. For one week, South Bank will turn into a Little India with fashion, food, music, film, art, idea, debates, and even cricket. ENCOUNTERS: INDIA is the fourth festival in a series mounted by the Queensland Conservatorium Research Center that searches and explores how cultures connect through music. They looked at each culture through fundamentals of music basic to traditions: rhythm (drums), melody (voice), drone (strings), and creator (composer/guru). 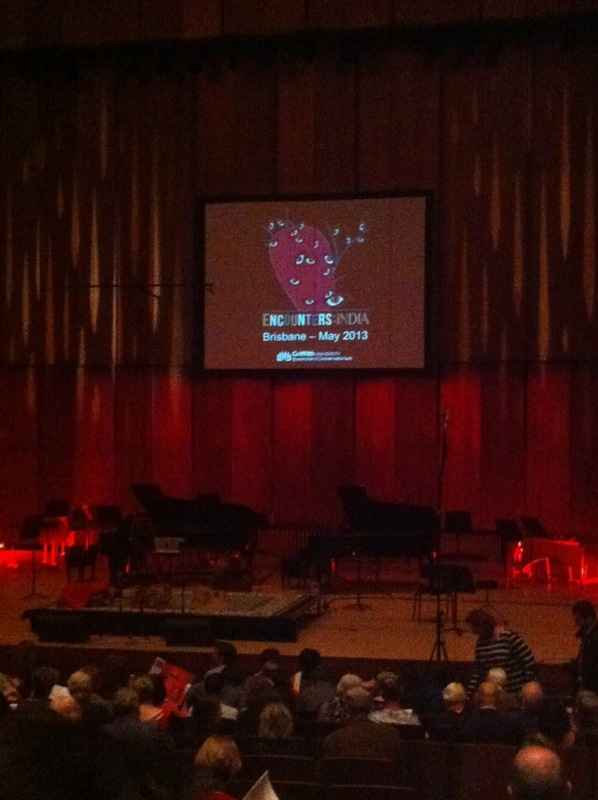 The concert could not have started off better than with south Indian percussionist Tunji Beier. He entered the concert hall from the back and made his way to the stage while his thavil echoed off all the walls and welcomed you the performance. The thavil, a barrel-shaped drum, is used in temple and folk music. Then, two percussionists, Aneesh Pradhan and Sudhir Nayak came to the stage and took us to the northern region of India. The tabla, two small hand drums, is usually considered an accompanying instrument but it was the focus this evening with their rich sounds. I closed my eyes and felt like I was back in India. My last visit was a few years but it felt like yesterday when I was dressed up in my pink sari and dancing with the beautiful children of the Dalit villages. I don’t know the name of the beautiful singer that graced us throughout the evening with her voice but she was probably the highlight of the evening. Before the performance, I spotted a beautiful lady dressed in a sari and complimented her on it. She was so nice and complimented my dress as well. Little did I know she was going to perform shortly! So happy to know that her gorgeous voice fits her kind personality. Wish I could go to the other events that were listed in the program but so thankful to have an evening transported back to India. Thank you so much Mom! 🙂 I promise to study very hard. I can’t wait for you all to visit Brisbane. Love you!